Many varieties are cold hardy to -20F (- 29C) when well rooted in the garden. 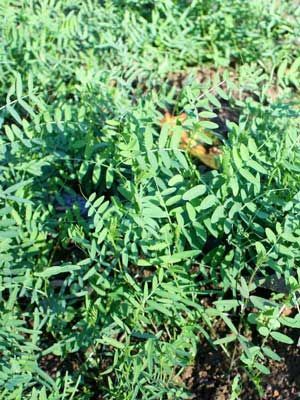 When using hairy vetch to improve very poor soil, mixing a balanced organic fertilizer into the soil before planting will give better results. Sow hairy vetch in late summer so the plants can become established before cold weather comes. Broadcast seed into cultivated soil so that the seeds are about 3 inches (7 cm) apart and one-half inch (1 cm) deep. No thinning is required. Hairy vetch stays small through winter and makes vigorous growth in spring. It is highly recommended as a cover crop to grow before tomatoes. Take down plants in spring, 3 weeks before the bed is needed for summer vegetables. The easiest method is to slice plants off at the soil line with a sharp hoe. The cut plants can be allowed to dry into a surface mulch. Hairy vetch can become weedy if allowed to produce mature seeds.